Is there a better way to understand your customer’s mind and to delight him or her in a way never imagined? 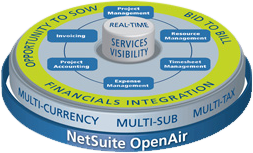 Enter Netsuite CRM or Customer Relationship Management, a blessing for customer focused organizations. 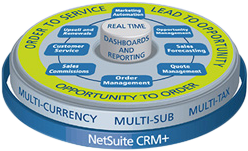 NetSuite CRM+ software brings powerful customer relationship management (CRM) capabilities which also include sales force automation, customer support and service, marketing automation and flexible customization, everything on a powerful web-based CRM solution. NetSuite CRM+ gives your business all the CRM proficiencies you'll need to achieve the sales and customer relationship management practice, with greater power and ease than other CRM solutions. Unlike typical CRM solutions, NetSuite CRM+ includes powerful sales performance, order management and marketing effectiveness capabilities as standard features. 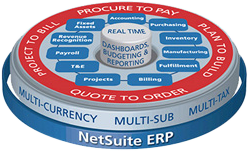 NetSuite CRM+ is the only CRM solution that is completely integrated with the back office order management, fulfillment, and financials reducing manual entry and risk of error, and accelerating processes. These CRM capabilities are made more impressive with easy to use dashboards, customization and web services, and in-system high volume marketing campaigns, advanced forecasting, contact management, and opportunity management. If you are looking for NetSuite partner / solution provider to help you implement NetSuite CRM, get in touch with us NOW and we will help you build a robust CRM solution.